Buying office supplies online is so convenient, and can save you time and money. However, finding the exact office product right for your needs can be difficult, especially when looking for products with thousands of choices. 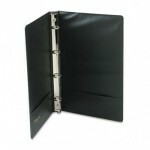 View binders and ring binders for the office are perfect examples. There are different styles, sizes, colors, etc. so sorting through the mass of items gets confusing. Read on for helpful tips to help you become an expert Binder Finder. It’s unbelievable that searching on many office supply websites for binders will bring up 1700-1800 products, so the first thing to do is pare them down. There’s really only 3 primary sizes for binders, standard letter, 14 inch legal size binders, and 5-1/2 x 8-1/2 small size binders. 95% of the time you’ll need a standard letter size binder. Next, sort by the color of binder you need and the possible product choices will shrink considerably. There are two distinct types of binders. View binders which have clear overlays covering the vinyl of the binder so you can insert cover pages into your binder or spine, and regular “non-view” binders which have no overlay covering. View binders outsell regular binders 5 to 1, and are actually less expensive many times, so most people go with view binders. Next, you’ll need to determine the ring capacity for your binder. Ring capacities vary from 1/2″ all the way up to 5 inch binders, and the higher the ring size, the more sheets of paper a binder holds. The most popular sizes are 1 inch and 2 inch binders, but more and more people have large filing needs, so 3 inch binders, 4 inch binders and 5 inch binders which can hold as many as 1050 sheets are growing in popularity. The last feature to sort by before getting to brand and price is the ring “style”. Not long ago, most all binders were either round ring, the rings used in typical school binders, and D ring binders designed more for office needs. Today there are as many as six different ring styles all with various price points. The premium priced ring style is EZD ring binders which have “easy open” one touch rings, and the D shape style which holds more paper and allows the sheets to turn easier. Next are slant rings, then gapless rings, standard d rings and then round rings from a price hierarchy standpoint. I recommend the D ring binder for a good combination of durability and value. After sorting by size, color, ring capacity and then ring style, you should be down to only 10-15 choices – much more manageable than 1700! Now it’s about brand and price, which are somewhat tied together. The best known national brands for binders are Avery, Wilson Jones, Samsill and Cardinal, and all make quality binders at reasonable prices. However, I recommend Universal brand binders if you are value conscious as they make excellent quality binders at prices that are 25-35% less than the national brands. Finally the question I hear most often is where is the best place to buy binders online? My advice is to stay away from the office superstores who no longer have the best prices, and have huge corporate structures that create poor customer service. I buy office supplies online at smaller independent office products dealers, and look specifically for companies that do good work in the community as well as offering low prices and free shipping. There are even new office products companies out there that work with great charities and donate half their profits to worthy causes. I feel good buying from companies like that, and you will too. Enjoy today and happy hunting looking for that perfect binder! By: Tristan Hill – Tristan is a writer and office supplies expert in Austin, TX. He loves music, companies that give back to the community, and great enchiladas. This entry was posted in Office Supplies Shopping Tips, Product Information and tagged 3 inch binders, d ring binders, office products, Office Supplies Online, universal, view binders. Bookmark the permalink. This is a good blog, Im learning to perform exactly the same upon WP. Best of luck and all sorts of the best. Thanks for the question Brenda. Unfortunately the largest size ring we have in legal size binders is 2″. We’ll email you with a few options. Thanks again! The office I work at has decided to some organizing and is looking for some new business binders to use. So thank you for mentioning that there are two types of binders: view binders that you can insert cover pages into and regular ones, which have a typical blank cover. I’ll have to share this with the company so they know that they can choose whether they want cover pages for our business folders or not. You’re welcome, Ashley! If you have any additional questions, please let us know! Thank you for your feedback.